The first leg of Jimmy Cricket’s touring play takes place this weekend. No more Fiffing and Faffing, which had its debut last September at the Blackburn Empire Theatre in Lancashire, will be performed at The Met in Bury on Saturday (23 February). It will be followed by performances at the Chorley Theatre (19 May), Bridlington Spa (18 July) and Gladstone Theatre on The Wirral. 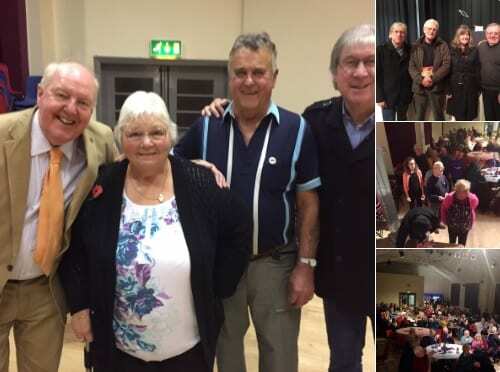 All-round entertainer Jimmy, who wrote the play, also performs in it along with Jonathan Young from The Bachelors, and actor Colin Meredith, who has made several notable appearances in ITV’s Coronation Street over the years. Book one of Saturday’s two shows (2.30pm and 7.30pm) here. Jimmy Cricket and his new play have been the focus of an article in the Lancashire Telegraph. 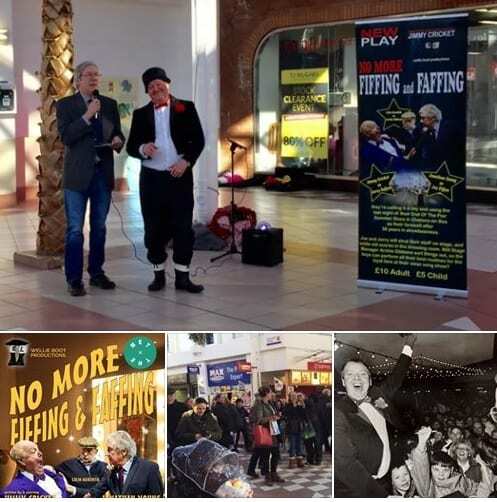 No more Fiffing and Faffing had a successful debut last September at the Blackburn Empire Theatre in Lancashire. It will now be performed at The Met in Bury (23 February), Chorley Theatre (19 May), Bridlington Spa (18 July) and Gladstone Theatre on The Wirral as part of a tour across the North of England. 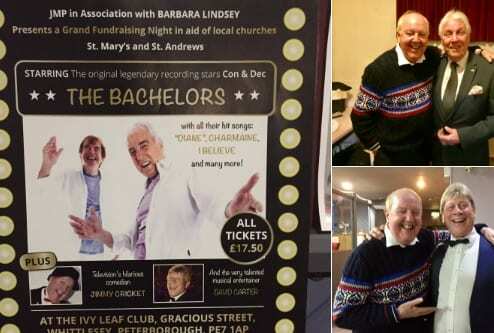 All-round entertainer Jimmy performs in the play, along with Jonathan Young from The Bachelors, and actor Colin Meredith, who has made several notable appearances in ITV’s Coronation Street over the years. Visit here to book one of the two shows (2.30pm and 7.30pm) on Saturday 23 February. 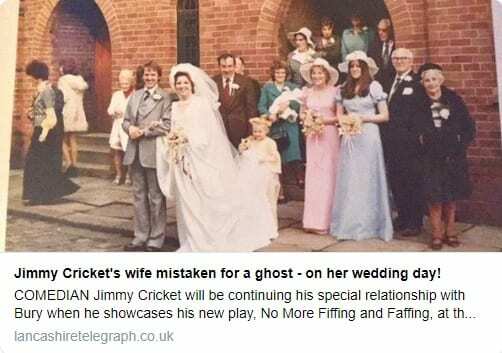 The Lancashire Telegraph previewed the play in Bury and highlighted Jimmy and Mrs Cricket’s strong connections to the town. 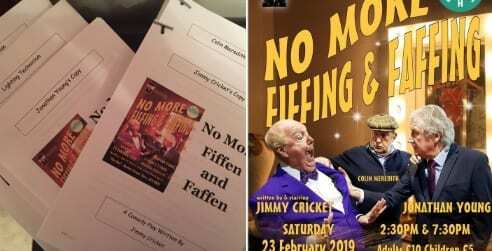 The article begins: “Comedian Jimmy Cricket will be continuing his special relationship with Bury when he showcases his new play, No More Fiffing and Faffing, at the Met later this month. Set at the end of the pier, it’s the tale of a comedy double act who prepare for their final performance after many years on the road together. As the final show looms, long-held resentments come to the fore. Jimmy was inspired to write the show, in which he also stars, after seeing the success of fellow comedian Bobby Ball’s first steps into writing for the stage. No more Fiffing and Faffing was premiered at the Empire Theatre, Blackburn, last year and Jimmy is delighted to be bringing it to Bury. ‘Mrs Cricket and I have a strong connection to Bury,’ he said revealing that he and his wife May had their first home in the town on Wash Street less than a mile from the Met. Famous comedian Jimmy Cricket has been promoting the first leg of his touring play at a shopping centre in Greater Manchester. 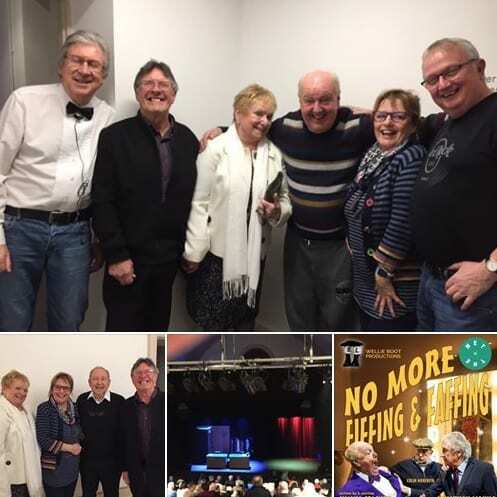 No more Fiffing and Faffing, which got a great reception from the audience on its debut last September at the Blackburn Empire Theatre in Lancashire, will now be performed at The Met in Bury (23 February), Chorley Theatre (19 May), Bridlington Spa (18 July) and Gladstone Theatre on The Wirral. Jimmy, who wrote the play, was at the Mill Gate Shopping Centre in Bury at the weekend to let the people of the town know all about the Wellie Boots production. The stage is set for more performances of Jimmy Cricket’s first play. No more Fiffing and Faffing got a great reception from the audience on its debut last September at the Blackburn Empire Theatre in Lancashire. 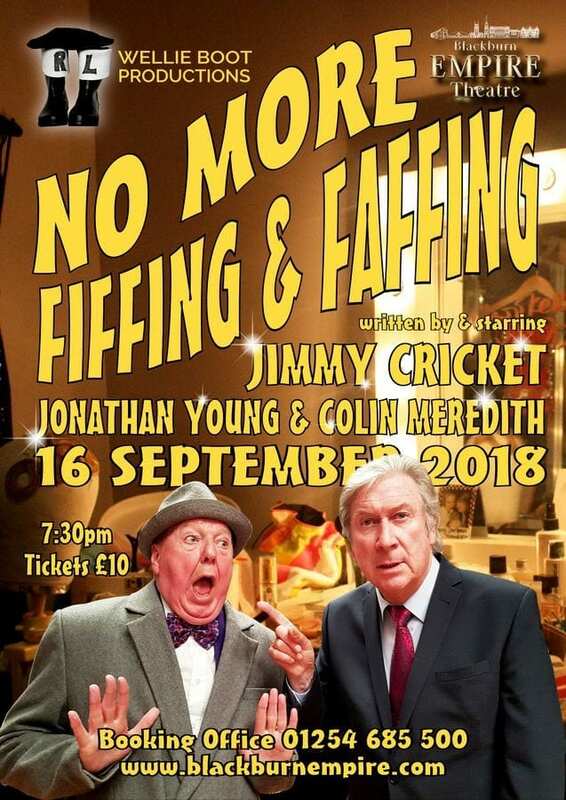 Appearing with funnyman Jimmy is Jonathan Young from The Bachelors, and actor Colin Meredith, who has had several notable appearances in ITV’s Coronation Street over the years. The play will be performed at The Met in Bury (23 February), Chorley Theatre (19 May), the Bridlington Spa (18 July) and the Gladstone Theatre on The Wirral. Jimmy Cricket’s first play, which got a great reception from the audience on its debut performance, is touring northern England in 2019. No more Fiffing and Faffing was staged for the first time in September this year at the Blackburn Empire Theatre. The play will now be performed at The Met in Bury (23 February), Chorley Theatre (19 May), the Bridlington Spa (18 July) and the Gladstone Theatre on The Wirral. 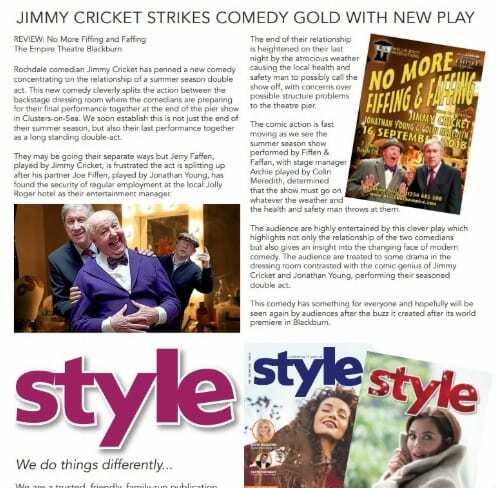 No more Fiffing and Faffing was reviewed in the latest edition of the Rochdale-based Style magazine (see image below). The show, written by Jimmy, is an hilarious look at the end of an era of British comedy. It is about comedy double act Joe Fiffen and Jerry Faffen on their last night in showbusiness. As well as looking as some of their classic sketches, they’ll be settling some old scores in the dressing room. Jimmy Cricket’s play just days away – don’t miss it! The one and only performance of Jimmy Cricket’s first play is now only a few days away. No more Fiffing and Faffing will be staged at the Blackburn Empire Theatre on Sunday (16 September) at 7.30pm.